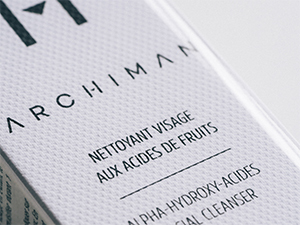 Here at Archiman, all our products are made from natural and wholesome active ingredients. Each product contains a minimum of 95% natural ingredients. The remaining 5% are the ones that give texture and stability, or preservatives, with no risk to health or the environment and which do not compromise the effectiveness or safety of our products. The sea offers us a marvellous antioxidant gel to protect your skin from the harmful effects of the environment: Edible Seaweed (Undaria Pinnatifida). This is a real “urban shield” which features in all the products in our range. A unique product to protect your skin and revitalise your epidermis. It is packed with antioxidants which protect the skin from the damage caused by harmful UV rays, harsh weather conditions, exhaust fumes, cigarette smoke and pollution. Each ingredient is rigorously selected according to its effectiveness as well as its integrity. We make sure that each one responds perfectly to our product specification and does not present any toxic risks, irritating or sensitizing your skin. If we are in the slightest doubt, we keep going with our research in order to offer effective and innovative products. And because your health and our environment are our priority, we have created our #Archiblacklist of controversial ingredients which clearly go beyond current legislation and which will never be used in our products. Here at Archiman, we went above and beyond our Archi Market Research! We have never tested our products on animals – but only on our friends. And believe us, there is nothing better for getting feedback on formulas, textures, perfumes, effects, sensations… A goldmine of ideas and inspiration. We’ve already said it guys: we love you! A big thank you to #Eric #Barthélemy #Alexandre #Dominique #Anis #David #Daniel #Louis #Jules #César #Fifi #Sylvain #Mehdi #Guillaume. And all the others for your contribution on our product development. Parabens #NotArchiman : Parabens are used in numerous cosmetics, food products and medicines because of their antibacterial and antifungal properties. Parabens can provoke allergies (urticaria and dermatitis) and accelerate the ageing of the skin in the sun. But what is even more worrying is their capacity to be absorbed by the body. Furthermore, several studies have shown that parabens interfere with the hormonal receptors and disrupt the hormonal balance. Silicones #NotArchiman : Identified under the names: Dimethicone ; Cetyl dimethicone copolyol ; Phenyl trimethicone ; Stearyl dimethicone. These entirely synthetic substances are harmful to the environment and therefore indirectly to our health. Additionally, in shampoos, they tend to block the scalp. Phenoxyethanol #NotArchiman : Phenoxyethanol is used as a solvent for some preservatives (like parabens) and sometimes as a stabilizer in perfume. It is allergenic and can induce eczema and urticaria. It can induce neurotoxic effects and neurological disorders as it passes through the dermis and the placenta. Lastly, phenoxyethanol may cause cancers and reproductive disorders in men. PEG’s (PolyEthylene Glycol) #NotArchiman : This family of chemical compounds can be found in many cosmetics as a surfactant, detergent, emulsifier, conditioner or skin humectant. Apart from the fact that they are extremely polluting to produce and permanently contaminate the environment, they contain several toxic contaminants (ethylene oxide, 1,4-dioxane, polycyclic aromatic compounds, heavy metals …) known to be carcinogenic. Phtalates #NotArchiman : This is a naphthalene derivative aromatic hydrocarbon used in plastics and produced from coal tar or petroleum. Phtalates have the power, via their metabolites, to interfere with hormone function causing altered reproductive development, organ malformation, obesity, precocious puberty or breast and testicular cancers. Synthetic perfume #NotArchiman : The term perfume (or fragrance) found in lists of ingredients often implies a complex blend of several chemical compounds. Some of these chemical substances can trigger allergic reactions or interfere with hormone function. Mineral oil #NotArchiman : Mineral oil is derived from petroleum and often used in beauty products as a barrier to keep the skin moist in several hydrating products as well as in haircare products which keep the hair shiny. Skin irritations and allergies can be caused by the HAP contained in these oils. Sulfate #NotArchiman : Sodium Laureth Sulfate and Sodium Lauryl Sulfate are extensively used in several beauty products. These are chemical foaming agents which have an ability to cleanse effectively at low cost. They have therefore replaced soap in several cosmetic products as well as shampoos. Their frequent use eliminates the skin’s protective layer thus exposing it to diseases. Used in shampoos, it weakens the scalp, encourages the development of dandruff and causes irritation, itching, tangled hair, split ends and leads to hair loss (the last straw!). Sodium Lauryl Sulfate is equally absorbed by the body and acts as a hormone disruptor with serious consequences.